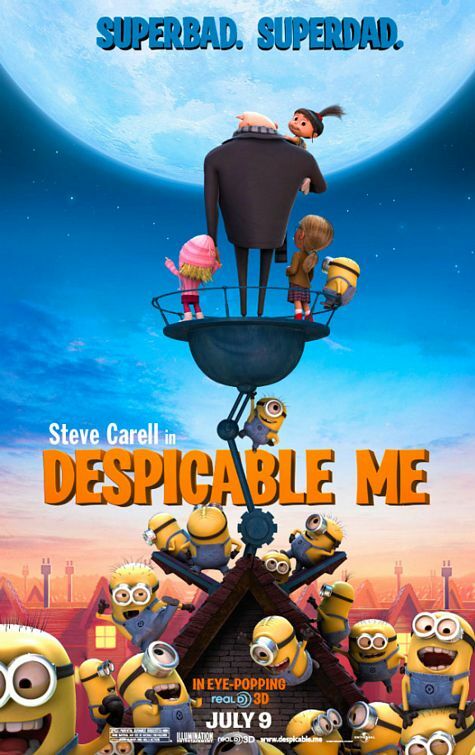 Gru is a mastermind criminal whose reputation is on the line after a new criminal named Vector steps on to the scene. In traditional Spy vs. Spy fashion the two criminals try to out do the other. Trying to gain an upper leg on his rival, Gru uses three orphan girls as pawns in one of his diabolical plans. Something he never expected however happens, he finds himself becoming attached to the little girls. "Despicable Me" is surprisingly one of the most heartwarming and laugh-out-loud movies of the summer. It is an animated feature that I went into with terribly low expectations, but came out very pleased. For starters the promos leading up to the film never caught my attention. I was confused by the minions and their witless humor did not (essentially sight gags and fart jokes) get me excited. Luckily every bit of promotion I saw never showcased how comical, imaginative and heart-filled the animated feature really is. Before getting to the heart of the story, which is really what won me over, I want to talk about the Spy vs. Spy aspect to "Despicable Me." I have always been a big fan of cartoons that feature rivals. One always trying to out do the other. Cartoons like Tom & Jerry or Road Runner and Bugs Bunny, something about them has always fascinated me and the result is no different here. Gru and Vector going back and forth trying to out do each other is hysterical. It helps that they are voiced by two guys I find to be pretty funny, Steve Carell and Jason Segel. The Spy vs. Spy shenanigans that Vector and Gru get in to not only cause numerous belly laughs, but their elaborate plans are fairly imaginative. Vector for instance has some outrageously imaginative and comical weapons he's designed. Gru too has a number of devices that are good for a laugh not to mention boggling the mind for a moment or too. One final note on the back and forth antics, something that we use to see all too often in old Looney Tunes cartoons was blowing each other up, only to survive with just a few burn marks. I miss that simple bloodless violence. Scenes like Elmer Fudd shooting himself in the face only to have just some black smudges on his mug, "Despicable Me" brings that back in a good way. Sure its mindless violence, but no one is getting hurt. I grew up watching that type of imagery and I'm fine. Another reason I am fine with the bloodless violence, is it is a very small aspect to the story. Gru and Vector's diabolical plans are mere trimming to the real heart of the animated feature. The real heart comes from a story we already know. One about a miserly person who finds love or more importantly learns how to use his heart and care for others. The three little girls are utilized throughout the 95 minute animated feature with real sincerity. The interaction between them and Gru is both humorous and gratifying. Surely being a father played into me enjoying this aspect of the film, but screenwriters Ken Daurio, Sergio Pablos and Cinco Paul all did a good job injecting true heart where it was needed to make the animated feature more than just another 3D cartoon. As for the 3D, I cannot speak for, because I did not watch it in 3D. I can tell you that it did not seem necessary. Outside of one scene where Gru takes the girls on a roller coaster, the 3D effects seem more used just to create depth. There are numerous site gags used by Gru's minions for the 3D effect, a majority of which, takes place during the end credits. The animation is vibrant and eye appealing throughout. "Despicable Me" is one of a few cartoons that I've liked where humans are given weird proportions and I'm okay with it. Usually and oblong head or oversized torso is too distracting for me, but here I found myself swept away in the imaginative world created by directors Pierre Coffin and Chris Renaud. About the minions for a moment. Before seeing the movie, I thought they looked ridiculous, absolutely stupid. After seeing the movie I can say those little yellow construction workers are kind of adorable. They half won me over. Their banter is pretty funny. I like that they speak gibberish and to the animators credit, you can actually understand them in moments. That said, I do not like their sense of humor. Being minions they have the lowest denominator of humor. Meaning these guys are like brainless mongoloids. They are constantly laughing at stuff I just don't find funny. Little kids are sure to find them a riot, but for me they were borderline tedious in moments. Lastly "Despicable Me" is a surprise hit of the summer. Never thought I would enjoy this flick as much as I did. It reminds me of last year's "Cloudy with a Chance of Meatballs," which I thought looked terrible and ended up eating my words. Steve Carell and the entire voice cast all do great jobs in their roles. Carell really delivers a ton of charm behind the criminal mastermind persona. Charm that I'm willing to watch again and again, not to mention any further sequels that are sure to follow. It seems there is a similar theme to movies these days with toddler minded audience targets and fewer with adult minded content. Even the big budget Tangled didn’t have the same appeal of previous movies, long with The Princess and the Frog, Gnomeo and Juliet and Rango seemed limp in comparison. On the other hand Kung Fu Panda 2 was awesome and I’m looking forward to Cars 2. Recently I have been so busy and I hardly ever watch TV at home. When I have a spare moment I watch a show or in this case I saw this movie on my tablet when I was out of town on business. It’s really nice with my DISH Network employee Sling adapter because I have TV anywhere my internet goes and I use it all the time.